We are looking forward to providing you with a memorable day of fishing on the Chesapeake Bay with our fishing charters. Small groups and family fishing charters are welcome! Penny Sue Charters departs from the Anchor Yacht Basin on the South River. 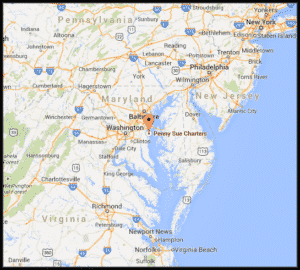 Easy access from Baltimore, Annapolis, Virginia, DC, Pennsylvania and surrounding areas. For the best fishing in Maryland, come enjoy the day with Captain Mike onboard the Penny Sue! The Chesapeake Bay is largest estuary (area where fresh river water mixes with tidal salt water) in North America. The waterways cover over 64,000 square miles of watershed and includes parts in Maryland, Virginia, New York, Pennsylvania, Delaware, West Virginia and Washington, DC. There is a wealth of sport fishing opportunities on the Chesapeake Bay including striped bass (rockfish), bluefish, drum (red and black), speckled trout, weakfish, flounder, spot, white perch and croaker. Penny Sue Charters is an experienced fishing charter near Annapolis, Maryland who can help you hook any of these species. Penny Sue Charters stays up to date on the current regulations, reports and resources for fishing on the Chesapeake Bay in Maryland waters.